The Omron CP1H programmable logic controller has several different ways to control the program and the way in which your program executes. Sequence control, Subroutines, and Step instructions can be used. These are just a few ways in which the controller will execute your logic using a synchronous PLC scan. 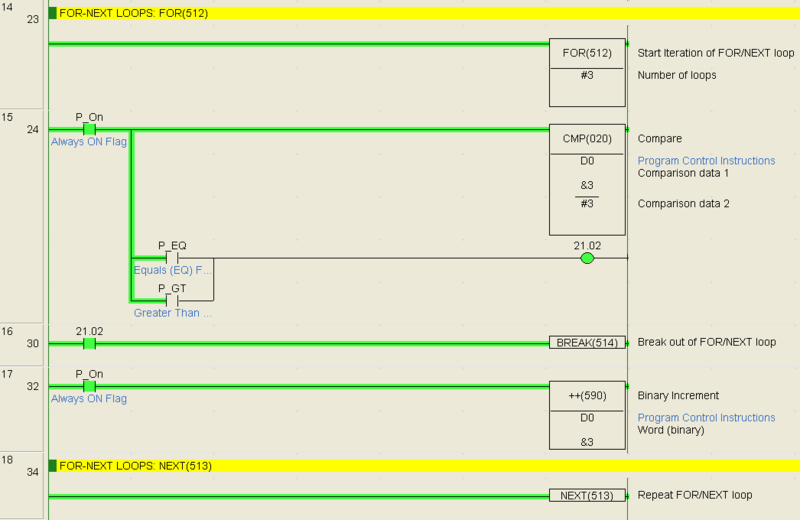 Understanding the PLC program scan will explain the synchronous and asynchronous program scanning. 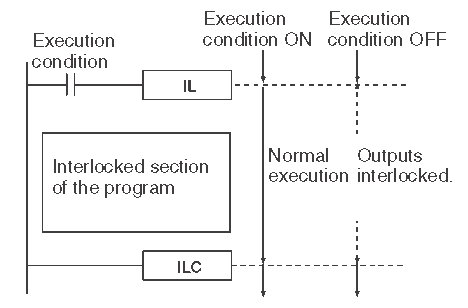 Interlocks, Jumps, For Next Loops, Subroutines and Step instructions are some of the ways in which we can control our program in the PLC. We will be looking at some of these instructions in the Omron CP1H PLC. Examples of some of the instructions will be presented. Several different program control instructions are available in the CP1H. A full explanation can be obtained by using the help menu in the CX-Programmer software or the Programming Manual for the CP1H. Links are provided at the end of this post. SBS(091) when used will be scanned and executed every cycle of the PLC that the input condition is on. @SBS(091) when used will be executed when the input condition turns from off to on. This will trigger the instruction to happen only once. Please refer to the programming manual or help file in CX-Programmer for different variations of the instructions that you want to use. We will now go over some of the program control instructions in the Omron CP1H. This will give you a general idea of the instructions available. The first few program control instructions are basic for all Omron programs. This instruction indicates the end of the program. It can also be used in interrupt tasks to indicate the end of the task. 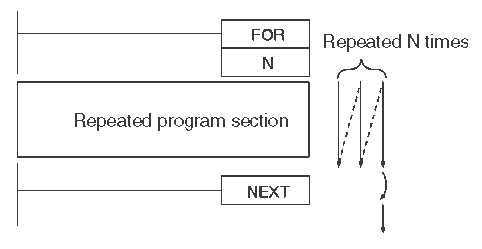 At least one END instruction must be present in your program in order to indicate the end of the program. This automatically happens when you start a new project with CX-programmer. This instruction means no operation. The instruction has no function when scanned in the program. It is sometimes used as a place holder when programming in mnemonic. (CX-Programmer – View Mnemonics (Alt +M)) You will see this instruction past the END statement in your program. This will not display in ladder logic. These instructions are used together. 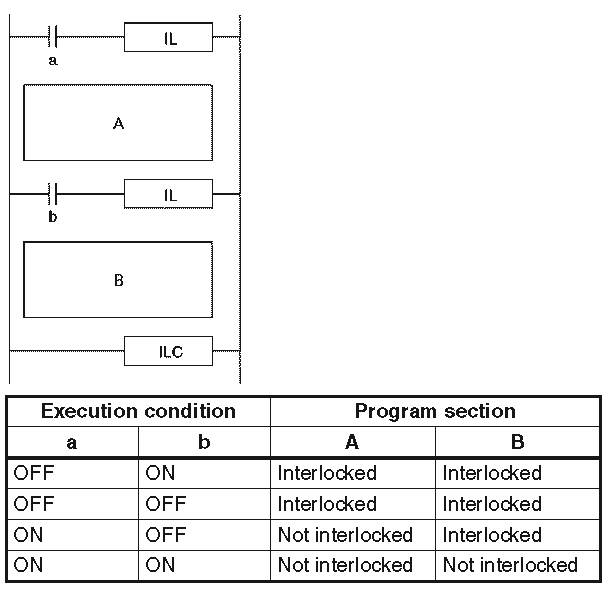 When the execution condition is off, all of the outputs between the interlock and interlock clear are interlocked. (Reset / Off) If the execution condition is on then the program executes normally. 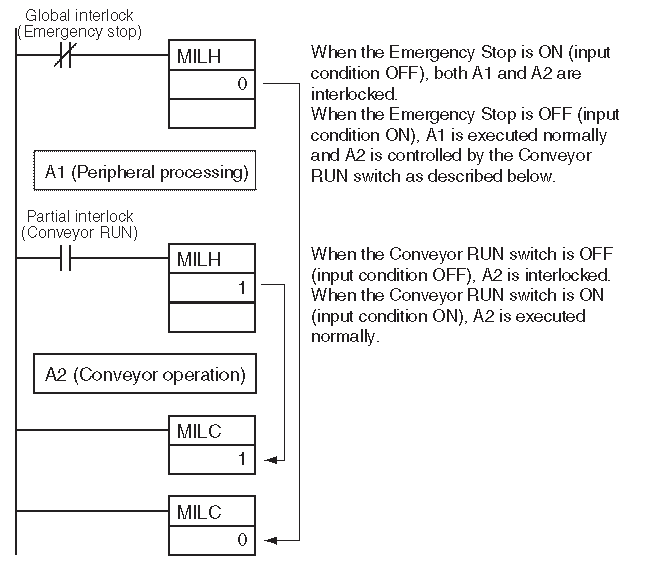 The following table shows various outputs and the way in which the interlock function will be executed. In our example we are using an always on flag to turn on the first output between the two instructions. When 21.00 (execution condition) is turned on the program functions as expected and turns on the output 100.00. If 21.00 is off the output 100.00 is also off. You can have more than one interlock instruction for a interlock clear. This will allow you to section off your program in blocks depending on the execution condition. The Omron CP1H also has multi-interlock differentiation hold, multi-interlock differentiation release and multi-interlock clear instructions. 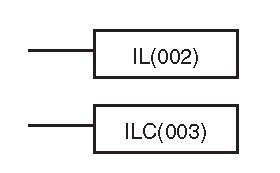 (MILH(517), MILR(518), and MILC(519)) Unlike the standard interlocks, these instructions can be nested together. You can see that MILH 1 is nested within MILH 0. When the execution condition is on, no jump is made and the program is executed normally. If the condition is off then the program jumps directly to the first jump end instruction with the same number. 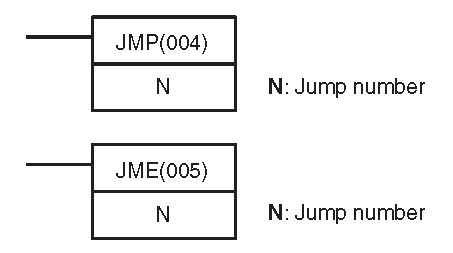 The instructions between the jump and jump end are not executed so the previous status of the outputs is maintained. The CP1H also offers other jump and jump end instructions. The following chart will explain the differences between the instruction. The instructions between the FOR and NEXT are repeated for a specific number of times. We use the BREAK instruction to exit the FOR NEXT loop without finishing. We could also use the JUMP and JUMP END instructions to exit out of this loop. FOR NEXT loops can be nested up to 15 levels. The above shows you one nested FOR NEXT loop. Subroutines are used to split your program up into manageable sections or use code several different times in the scan. The following are a list of subroutine instructions in the Omron CP1H. Subroutines are used with a SUBROUTINE CALL that will call up the subroutine number within the scan of the PLC. The SUBROUTINE ENTRY is the name or number of the subroutine that you are calling. It is the start of the code that will be executed. SUBROUTINE RETURN is placed at the end of the subroutine code. It tells the PLC to resume scanning the code after the location that the SUBROUTINE CALL was executed. This instruction will call the subroutine. This marks the start of the subroutine. This is always programmed within the same task as the subroutine call instruction. This indicates the end of the subroutine. The MACRO instruction is similar to the SUBROUTINE CALL. It will call the subroutine but allow you to specify the inputs and outputs for the subroutine. S to S+3 are transferred to the macro area A600 to A603. The subroutine is executed and the outputs are transferred from A604 to A607 to D to D+3. 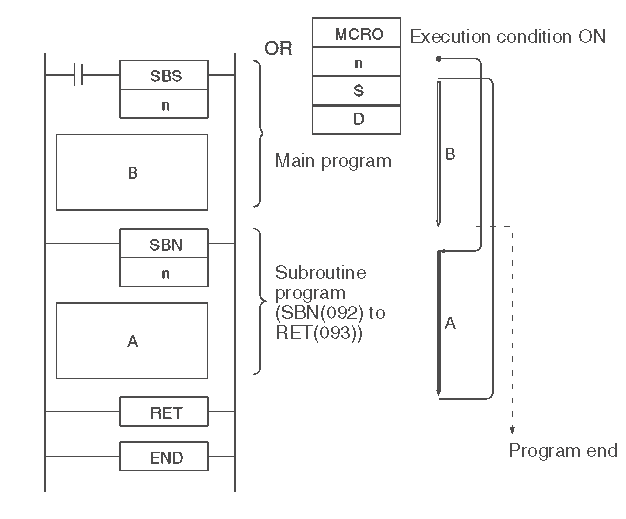 Here is the basic subroutine program. 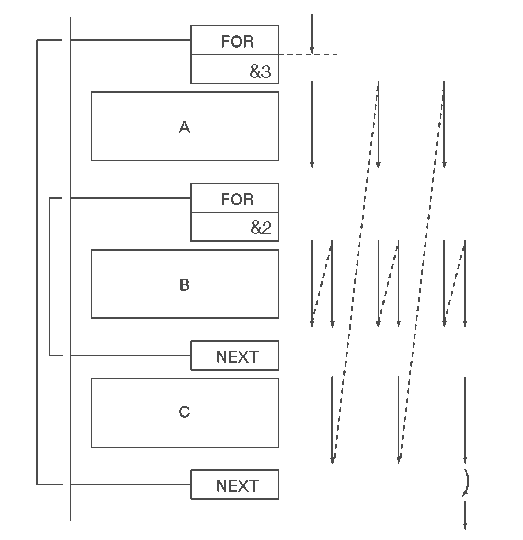 Subroutines can be nested up to 16 levels. In our example input 21.03 will call up subroutine 1. If 22.01 is on then output 100.02 is turned on. You will notice that the status of the outputs are maintained until they are scanned again. The step and step next instructions are used to set up break pointes between sections in a large program. The SNXT (009) is placed immediately before the STEP(008) instruction and controls step execution by turning the specified control bit ON. If there is another step immediately before the SNXT (009), it also turns OFF the control bit of that process. When defining the beginning of a step, a control bit is specified. Ending the step program area is a STEP(008) instruction without a control bit. 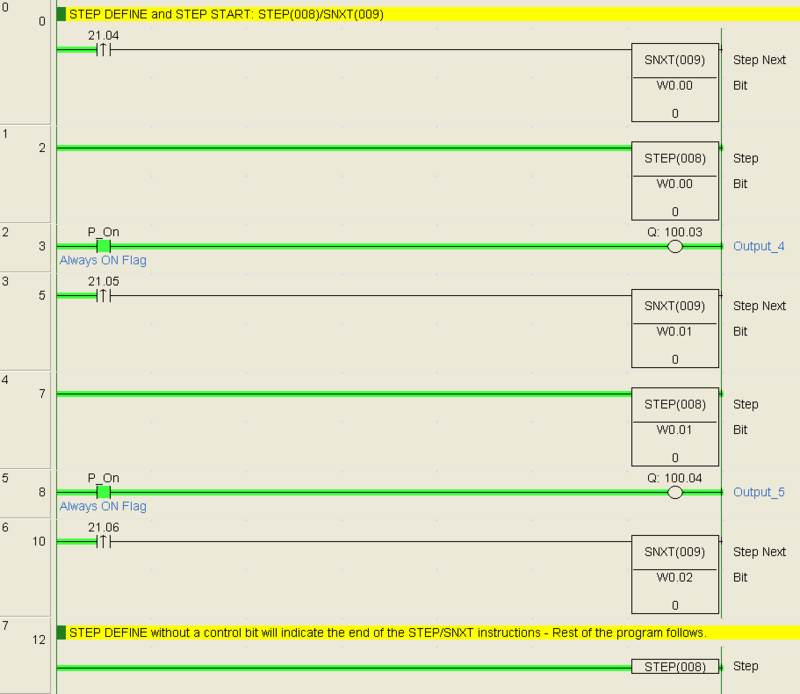 The step programming area is usually at the beginning rungs of the ladder logic program. 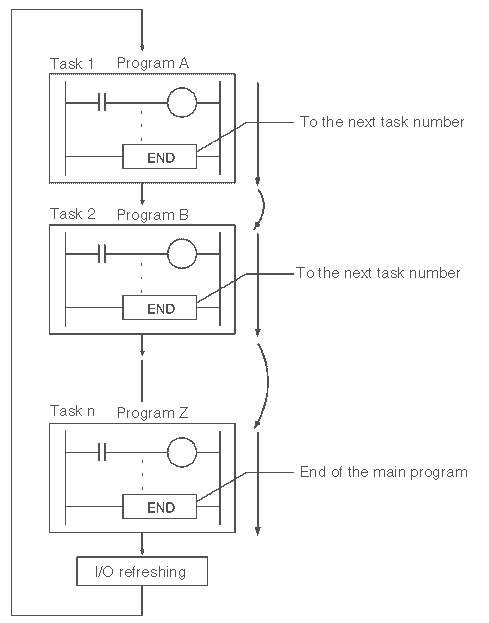 When SNXT (009) turns ON the control bit for a step, the control bit B of the current instruction will be reset (turned OFF) and the step controlled by bit B will become interlocked. Handling of outputs and instructions in a step will change according to the ON/OFF status of the control bit B. (The status of the control bit is controlled by SNXT(009)). When control bit B is turned OFF, the instructions in the step are reset and are interlocked. Refer to the following tables. Here is an example of the step / step next instructions. You can see that we have many different program control instructions in the Omron CP1H. This should give you a good idea of what is possible. See the YouTube video below on program control instructions in the Omron CP1H PLC. Next time we will look at table data processing instructions in the Omron CP1H PLC.